Bark Busters Home Dog Training explains why dogs pull on the leash, discusses benefits of walking your dog, and provides tips for a happy experience! Why do dogs pull on the leash? It's in a dog's DNA. In the wild, if an animal is trapped it naturally tries to get away. Although canines have been domesticated for thousands of years, dogs still have natural instincts. Dogs are natural pullers - which is why it's possible to get a dog to pull a sled. When a dog feels restrained it will naturally pull away. This is normal dog behavior. To combat a dog's natural instinct we must alter the dog's perception by teaching the dog to walk on a loose leash, the dog feels no restraint and therefore relaxes its instinct to pull. The only way to avoid this natural instinct to pull is to learn how to teach your dog to walk on a loose leash. It’s all down to using the right technique, coupled with the right training leash and equipment. The benefits of walking your dog are numerous and include providing your dog with exercise, which can help decrease your dog's chances of becoming overweight, reduce boredom and destructive behavior, diminish stress and anxiety and help you bond with your pet. Unfortunately many people avoid walking their dog because it becomes a chore rather than time they can enjoy together. According to Sylvia and Danny Wilson, Bark Busters founders, "Many dog owners tell us that walking their dogs becomes a battle of wills, and they lose control of their dogs either with pulling, barking, or simply lacking focus." The Wilsons also added, "Some dog owners would like to get out and about more but say they've had negative experiences, including interaction with unfriendly dogs which frightened them." Walk in a group or with a friend which provides more fun and safety for you and your pet rather than walking alone. If you encounter an unsupervised, intimidating dog, keep walking, don't stop. You might be crossing through what he believes is his territory. Always walk your dog on a comfortable, fixed length leash that is soft on the hands - a cotton leash works best. There should always be six feet of loose leash between you and your dog. Click here to learn more about why retractable leashes can be dangerous. Always walk your dog in comfortable and safe shoes. Aim for quality of walk and not necessarily quantity. 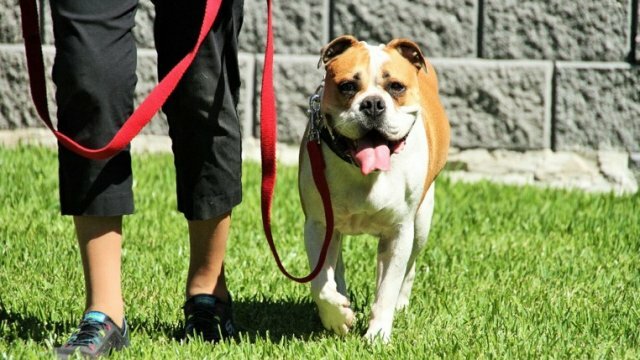 Short walks in a safe environment are a great way to start out and will provide an opportunity to educate your dog and get him accustomed to walking correctly. If your dog is unfriendly around people or other dogs, keep a safe distance and seek professional help. We're only a phone call away! If your dog should get into a fight during a walk, never jump in to 'rescue' your pet. Stay at the end of the leash and out of the fight to avoid being bitten. Use the leash to pull your dog away. Water can also be effective to diffuse a fight. Be aware of hot pavement. Your dog has sensitive foot pads which aren't protected by shoes like yours! Put your hand to the ground, and if it feels hot to you it will be hot for your dog. Look out for poisonous plants and generally avoid any plant or area that maybe problematic for your dog. Always keep proper identification on your dog. Are you have trouble getting your dog to properly behave on a walk? Contact your local Bark Busters dog trainer and behavioral therapist. We're here to help!